Our product development team has kindly provided these tips to maximize the efficiency of your Gibson Assembly® reactions with SGI's Gibson Assembly® HiFi 1 Step Kit. If you have any other detailed questions please contact techservices@sgidna.com, we are happy to work with you! 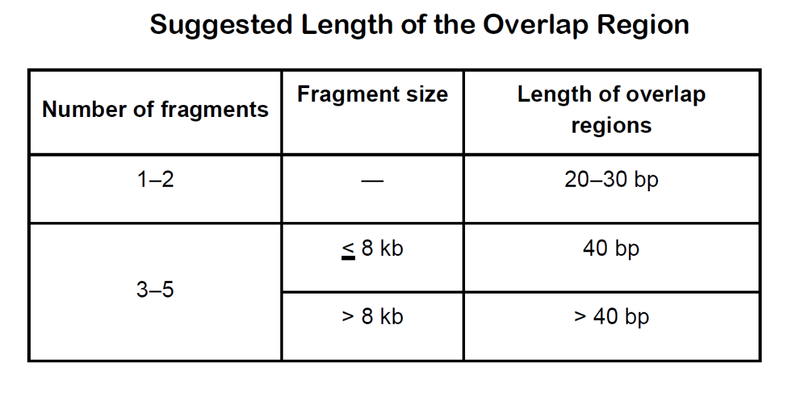 The optimal length of the overlap region depends on the number and length of the fragments in the assembly reaction. Longer overlap regions will result in higher efficiency for large fragment assemblies. You may need to optimize PCR amplification reactions when using PCR primers with long homologous overlap regions. We recommend using a high copy number vector such as pUC19 for small insert(s) (< 10 kb) or non-toxic gene(s). For large insert(s) or toxic gene(s), use a low copy number or inductive vector such as pBAC. Your DNA Concentration Does Matter! Make sure to use DNA samples with A260/280 > 1.8. For optimal results, use DNA at a concentration ≥ 40 ng/μl. If the amount of DNA is limited, the assembly reaction may be performed using DNA at concentrations between 20–40 ng/μl with reduced efficiency. Do not use DNA at concentrations < 20 ng/μl. Always use a high fidelity PCR polymerase when amplifying your DNA. For vector DNA prepared by PCR, make sure to gel-extract the linear product to minimize vector background. Purify DNA inserts by column or ethanol purification to remove restriction or PCR enzymes that could interfere with the Gibson Assembly® method. If your PCR reaction or synthetic assembly yields non-specific fragments, we recommend purifying the fragment of interest using gel extraction or another size fractionation method. Use a vector: fragment ratio of 1:1 to 1:5, depending on the size of the insert. For a fragment that is < 1 kb, we recommend using a 5 fold excess. Our HiFi kit has been optimized for a reaction volume of 5 μL substrate DNA and 5 μL of GA 1 Step Master Mix (2X). Transformation of the Gibson Assembly® product yields the most clones with high efficiency electrocompetent cells of 1010 cfu/μg of pUC19 plasmid. We recommend using Epi300™ electrocompetent cells (Epicentre® EC300-105). Dilute the assembled product 1:5 with nuclease free water before transformation. Note that the excess salt in the assembly reaction may decrease the transformation efficiency if not diluted. Always plate two plates (one low and one high volume). Although the efficiency of the assembly reaction may decrease with increasing number of insert fragments, the cloning efficiency should remain the same. Fewer observed colonies may not be indicative of an inefficient transformation. We acknowledge that some of you may run a "dirty" experiment every now and then, but we suggest you follow these tips to get the most successful reactions out of your Gibson Assembly® HiFi 1 Step Kit. For more help with your Gibson Assembly® kits, please contact techservices@sgidna.com We hope you have a productive and happy new year! I quite agree with you, the selection of expression vector is of great importance.